Affordable housing developer Sanctuary Homes consulted the local community before submitting a planning application to North Lanarkshire Council for 136 flats for social rent. The demolition of Elliot House is underway and should be completed by the end of this month. The demolition of the 55-metre-high Stuart House is due to start the week beginning April 8. The site is expected to be cleared by September. If its proposals are approved by North Lanarkshire Council, Sanctuary hopes to begin building new homes at Burns Road next February. 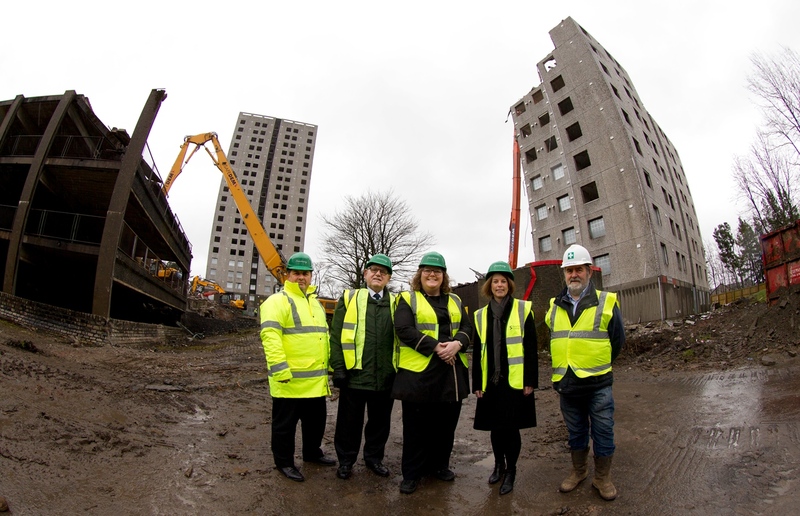 Every resident of the 12 tower blocks built in Cumbernauld in the 1960’s has been rehoused in the 331 replacement flats completed to date. A further 45 flats in Berryhill Road will be handed over next month. Building begins on another 23 flats in Berryhill Road in June. Sanctuary will also have handed over another 66 flats in Hume Road by September. Sanctuary’s proposals for Burns Road will soon be available to view on the North Lanarkshire Council website. Sanctuary is also in discussions with the council and Scottish Government about the potential regeneration of 169 flats in Millcroft Road.